November 2007 – an undated document restricted only to the Executive on the proposed inter-ministerial group. It states that the Minister is minded to include only those ministers who can deliver on objectives set out in the action plan. A paper tabled for discussion at a Ministerial Representatives Group on November 1 2007: It states that DARD representatives said their minister (Michelle Gildernew) had a strong personal interest in the issue and wished to be a member of the group because of her concerns about victims in rural communities. OFMDFM representatives wanted the two junior ministers to be members because of OFMDFM’s responsibilities for the gender equality strategy, the children’s strategy and social inclusion. The paper says that the Health Minister carefully considered the points but remained of the view that membership of the group should remain as originally proposed. The suggested membership was DHSSPSNI (chair), DSD (responsibilities for housing provision), DFP (responsible for civil law reform), DE, DEL (both education) and Minister of State (NIO involvement in criminal justice). This paper also states that there would be “administrative difficulties” to extend the group to include the Agriculture Minister and junior ministers. It added that instead the Health Minister would write to senior officials from DARD and OFMDFM to invite them to set out what actions and financial resources they could bring to the table as a contribution. A note written to Michael McGimpsey in May 2008 from the director of mental health and disability policy at DHSSPSNI states that the Health Minister presented a paper to the Executive meeting on December 18 2007 containing proposals for the IMG and suggested membership. Following discussion, the Executive agreed to the proposals with the proviso that he expanded the group to include the junior ministers. Minutes of first meeting held on May 21st 2008: Attended by Michael McGimpsey, Sir Reg Empey and Gerry Kelly, officials, a district judge and Dr Olive Buckley. Apologies were received from Peter Robinson who had a previously arranged speaking engagement, Catriona Ruane (who also had a previously arranged speaking engagement), Margaret Ritchie (who had urgent business to attend to) and Paul Goggins (who had pressing business in Westminster). Those in attendance heard from District Judge Marilyn Mornington, an acknowledged national authority on domestic violence issues, and Dr Olive Buckley, a General Practitioner who has provided a health clinic for teenagers and vulnerable adults including victims of sexual violence, mental health and sexual health problems. The minutes state a new SARC is due to be built in Antrim and will hopefully open in 2010. It was agreed that the group would meet again in October 2008. This states that meetings arranged for November 5 2008 and June 3 2009 were postponed for reasons including sickness and swine flu. Minutes of the second meeting held on September 30 2009: The only Ministers present were Gerry Kelly and Robin Newton (Junior Ministers, OFMDFM). Other departments were represented by officials. Apologies were received from Minister McGimpsey (who was sick), Minister Goggins, Minister Wilson, Minister Ritchie and Minister Empey. Minister Ruane hoped to join the meeting later. It appears from the minutes that she did not attend. Minister Kelly left “due to diary commitments”after a discussion on the minutes of the last meeting and a presentation from Women’s Aid. A press release was issued later that day by Ministers McGimpsey and Goggins to advise that the IMG had met and to announce the publication of the 2009/10 domestic violence and sexual violence action plans. Suggested date for the next meeting April 28th 2010 but to be confirmed. Email dated January 26 2010 from Domestic and Sexual Violence Unit (DHSSPS): Minutes attached of last meeting. The email says that date planned for next meeting (April 28th 2010) conflicts with the UK Violence Against Women and Girls IMG. So it was proposed the next meeting would be early May 2010 with DHSSPS Private Office to confirm details. Email dated 15 July 2010 containing minutes of third meeting of inter-ministerial group (held June 29th): Attended by Caitriona Ruane, David Ford and Alex Attwood, 13 officials from various departments and two PSNI representatives. The meeting was chaired by an official on behalf of Minister McGimpsey. This was Minister Ford’s first meeting of the group. Ms Ruane arrived late to the meeting to give a presentation on the work undertaken by the Department of Education. A PSNI rep delivered a presentation on the Multi-Agency Risk Assessment Conference (MARAC) initiative which has been in operation in Northern Ireland since January 2010. This seeks to reduce serious harm or homicide for victims of domestic abuse through multi-agency working and the development of a risk management plan. At that time, a total of 496 cases had been through the MARAC process. Of these, 23 were male victims and 675 children were affected. Minister Attwood joined the meeting after two presentations had taken place – the one by Minister Ruane and another updating the group of the Sexual Assault Referral Centre (SARC). Minister Ruane left before a discussion on the sexual violence and abuse action plan. Once the action plan had been agreed by those remaining, Minister Attwood left the meeting. An update was then given on the domestic violence strategy. It was agreed that work on domestic and sexual violence should be ‘harmonised’. Suggested date of next meeting was November 2010. Attendee list as of May 18th 2012 for inter-ministerial group held on May 24th 2012: To be attended by Ford, Bell and Anderson (junior ministers, OFMDFM). Apologies from five ministers. Briefing document for this fourth meeting: This states that one of the aims of the next meeting is to seek inter-ministerial endorsement for the new joint action plan for 2012-13. The agenda states that the IMG has not met since 2010 due to ministerial availability and that “all necessary business has been progressed through correspondence.” Dr Olive Buckley, chair of the SARC Steering Group, will deliver a presentation to the ministerial group on the new SARC building. The briefing paper states that this will cost in the region of £2m and running costs will be around £950k a year. Running costs will be met by DHSSPSNI and PSNI. The facility is due to be operational early 2013. DSD Minister Nelson McCausland has already given his support for the action plan in writing. May 28 2012: A briefing note from Marian McIlhone from the Domestic and Sexual Violence Unit to director Christine Jendoubi and Edwin Poots. She informs them that Minister Ford and Minister Anderson intend to raise the issue of low attendance at the IMG meeting of May 24 under ‘any other business’ at the Executive meeting of May 31. They also planned to highlight the importance that relevant ministers attend future IMG meetings. The timing on the letter is listed as “urgent” and it is recommended that they note the detail of this submission. The letter states that Minister Anderson commented at last week’s meeting that she was “not pleased” that only two Ministers were in attendance and she also noted with disappointment that IMG had not met for almost two years. Minister Anderson said it was very important that every effort is made to ensure better ministerial attendance at IMG. Marian McIlhone said it was made clear at the meeting that the Health Minister was on business that could not be deferred. (news releases on the DHSSPSNI website show that the Minister was in Barcelona speaking at a conference on May 24) Minister Ford had agreed to take the meeting. The briefing document refers to two recent Assembly questions and it states that Minister Anderson did acknowledge that important business “had been progressed in the interim through correspondence”. Although she also stressed the need to ensure that IMG meetings are scheduled “more appropriately” so that regular feedback on tackling domestic and sexual violence was provided to Ministers. In bold letters it states that the next meeting has been scheduled for November 14 from 10am to noon and that it is noted in Minister Poot’s diary and that of Minister Ford. 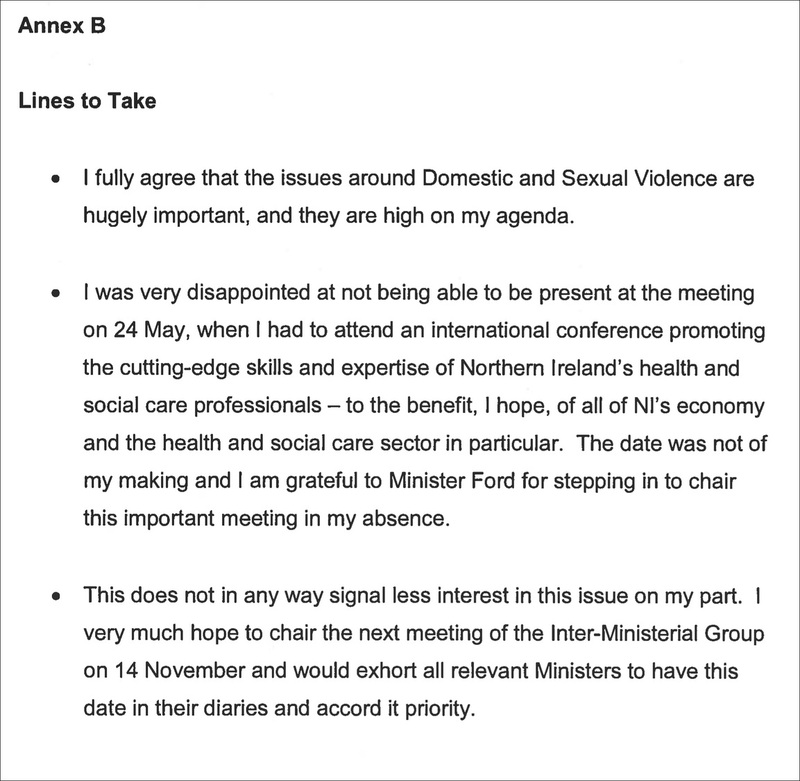 In the ‘lines to take’ in an annex at the bottom of the document, the Health Minister is advised to say he fully agrees that the issues around domestic and sexual violence are hugely important and high on his agenda and that he was very disappointed at not being present at the meeting on May 24 when he had to attend an international conference “promoting the cutting-edge skills and expertise of Northern Ireland’s health and social care professionals”. He is also advised to say “the date was not of my making” and that he was grateful to Minister Ford for stepping in to chair the important meeting in his absence.